MVCS Winter Program is designed to get our students excited about winter in the outdoors, both on and off campus. Students have the opportunity to explore skiing, snowboarding, or ice skating at local venues (fee based), or remain on campus for afternoons of snowshoeing, sledding, winter campfires, and more (free!). Fee-based Winter Program activities can be paid in two installments. Winter Program occurs on Monday afternoons (11:30am - 4:45pm ski and snowboard; 11:30-2:45pm skate and on-campus) for four weeks during January and February. Parent volunteers are essential to its success! Our skiing and snowboarding programs will be hosted by Waterville Valley Resort. Students will take a bus from MVCS at 11:30am, arriving at Waterville Valley at 12:30pm. Students will have group lessons, based on ability, with Waterville ski and snowboard instructors. 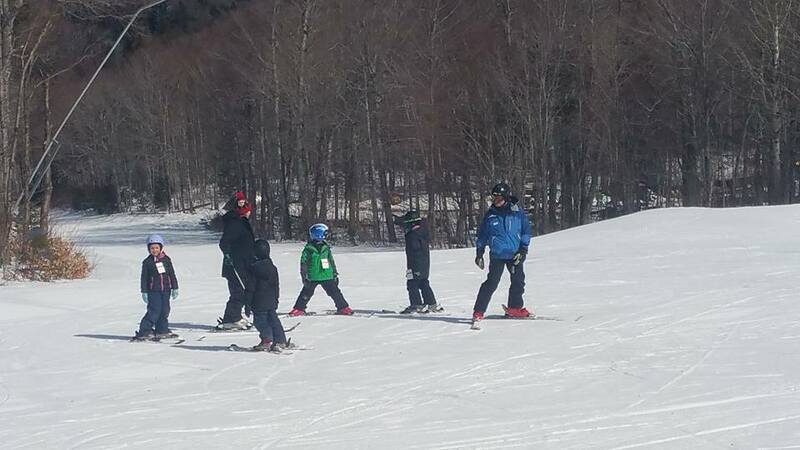 Lessons run two hours, from 1pm - 3pm, after which students can ski with chaperones until 3:45pm. All students will return on the bus to MVCS by 4:45pm. The total cost for our 2019 ski/snowboard program for 4 weeks for beginning and intermediate skiers will be $102 if renting equipment and $66 if you bring your own equipment. For our advanced skiers (no instructors) the cost for 4 weeks will be $70 with rentals and $34.00 if you bring your own equipment. All skiers and snowboarders must have a helmet, which is included if you are renting. Our ice skating program is located at the Plymouth State University Ice Arena. Students who participate in the skate program will ride on the bus TO PSU but will need to be picked up at PSU at 2:45pm at the PSU ice rink. There are no instructors for ice skating lessons but there will be the option of playing broom ball off skates. The total cost for our 2018 skate program for 4 weeks will be $34.00 if renting skates and $22.00 if you bring your own skates. All skaters must skate with a helmet (can be a bike helmet.) Helmets will not be provided. Students who participate in the skate program will ride on the bus TO PSU but will need to be picked up at PSU at 2:45pm at the PSU ice rink. Skaters may return/be dropped off to After-School Program if needed for that day. Our on campus winter program is designed to take advantage of all our 37 acre campus has to offer in the winter. Snowshoeing on nature trails, sledding, building campfires and drinking hot chocolate, building igloos, participating in "winter olympics;" students can be expected to be embracing all the glories of winter fun! Cost is FREE. January 7, 14, 28, and February 4. Possible makeup date will be Feb. 11th if needed.